The Apple iPad Pro has been in the rumor mill for very long and today, we have more confirmation that it might be truly in the works. A picture has leaked out from China showing off what is an iPad Pro prototype. 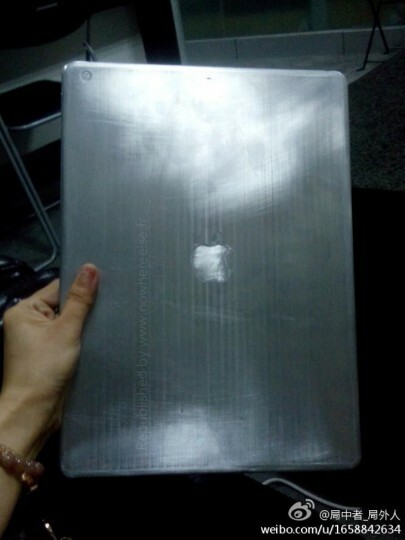 The picture shows the back of the alleged iPad Pro. We see an aluminum body with the Apple logo in between along with a camera lens hole in the corner. The tablet is said to be featuring a 12.9-inch display. As always, we’ll suggest you to take the picture with a grain of salt. The rumors have been saying that an iPad Pro might be released in the third or fourth quarter of the year. There were reports previously suggesting that Apple might be testing two prototypes of the device, one with a 2K display and the other with a resolution 4096 x 3072 pixels. Reportedly, Apple aims at the education and enterprise market with the iPad Pro. This is surely going to be an exciting year for Apple fans.with the iPhone 6 and iPhone 6 phablet rumored to be coming with much larger displays than what we’ve seen in the previous iterations. The iPad Pro if released will add another product line for Cupertino. We still await a concrete report on the iPad Pro and as always we’ll keep you informed. Till then, tell us if you would like an iPad with a 12.9-inch display?